It is incredibly important when selecting your new wood burning or multi-fuel stove to consider the Kw output in terms of is it appropriate for the size of your room and will it meet the needs of you and your home? Step 4) Add 10% for exposed locations. It is worth noting that sizing a stove to heat anything other than rooms directly adjacent should be discouraged; high ceilings may also have to be taken into account. With regards to the physical size of a stove, when installing into an existing fire place you must allow at least 100mm to 150mm (4″ to 6″) behind and at the sides to allow adequate air to pass around the body of the stove. 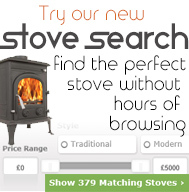 For the sizing requirements of the hearth, please click here and for stove distances to combustible materials, please click here.